Many of us have been following the conflict in Syria and news of possible involvement by the United States. This article from the Washington Post summarizes the situation, arguing that while civil war is unavoidable, our limited involvement may make chemical warfare less likely in this and other conflicts. As we consider how to pray, and how to engage our political system, Jesus’ teachings tell us that our aim should be a peace with justice; that we should have compassion on and seek solidarity with all who suffer; and that God is with us at all times, in all things. God of all the nations, we pray for our sisters and brothers in Syria. May wisdom arise; may justice spring up; may peace and mercy in time come to bloom among them. May the longings of our hearts be a part of your holy power, always at work in the tombs of the world, bringing resurrection. Amen. Usually, when people talk about walking around in circles, they mean they’re not getting anywhere. Remember the Winnie the Pooh story, where Piglet and Pooh traipse round and round a little copse of woods in search of Woozles, only to have Christopher Robin point out that the prints they were so fearfully tracking were actually their own? 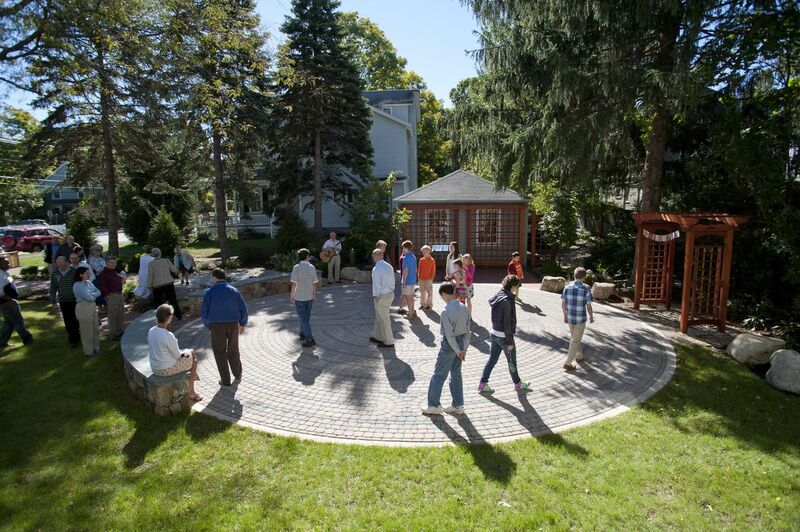 Unlike Pooh and Piglet, visitors to our Welcome Garden walk around in circles quite intentionally — pacing around our stone labyrinth in a kinetic prayer, a deliberate slowing, a meditative journey. There’s something about winding along the twisting circuits that calms the mind and restores the spirit.